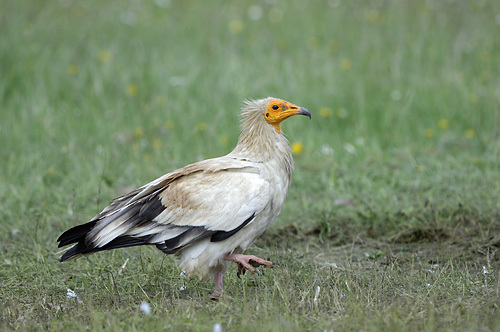 Exclusively for guests of Finca Las Abubillas we offer hides for photographing birds. We work with a few well known hide-owners, who all have the required licences. We can arrange the dates, meeting places, etc. Most of these activities must be planned a long time in advance, so make sure you book in time. Prices vary between € 60 and € 275. You need at least a telephoto lens of 400 mm and a steady tripod. The following species can be photographed from hides: vultures (Griffon, Black and Egyptian), European Bee-eater, Common Cranes, Great Bustard, Little Bustard, Lesser Kestrel, Black shouldered Kite*, Roller*, Spanish Imperial Eagle, Bonelli's Eagle and Little Owl. 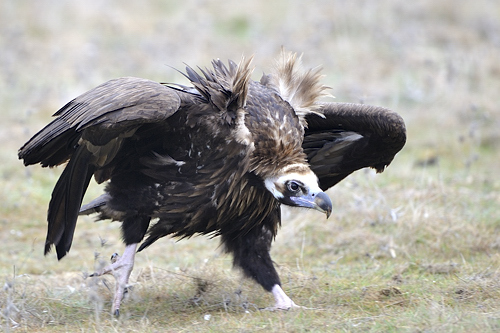 Close to Monfrague National Park you can photograph the three species of vultures that live in Extremadura. The hide has a two-way mirror. Best period: all year round. 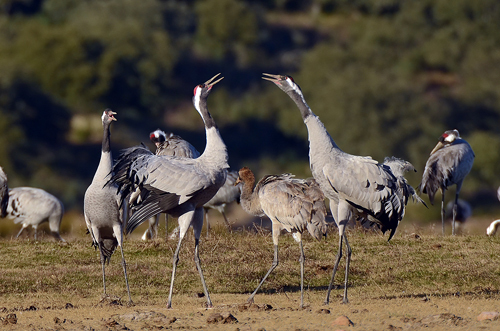 Up to 130,000 Common Cranes overwinter in Extremadura. 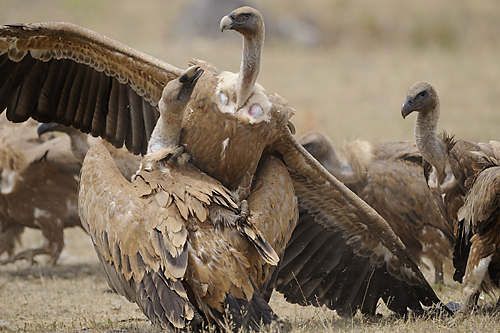 During December we offer two hides to photograph these impressive birds. 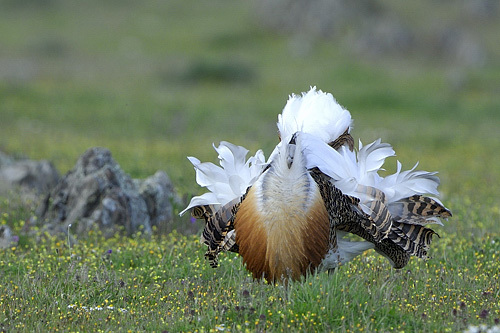 Photographing Great Bustards during their courtship is an extremely rewarding experience. 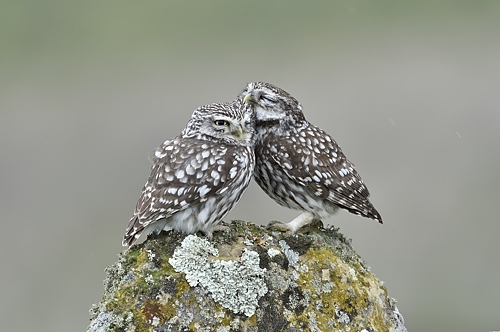 This activity is only for experienced bird photographers, as you will need to stay in the hide for at least 14 hours. We advise you to book for two days to increase your chances of making good photos. Period: March 15th till the end of April. 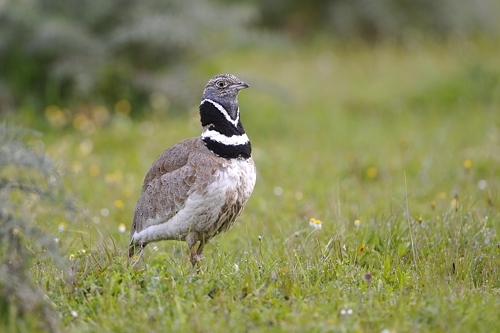 Between April 20th and May 10th is the best time for taking photos of Little Bustard on their leks. There is only room for two photographers. 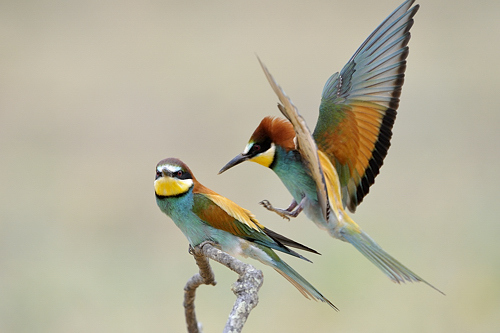 From April 15th till May 15th is the best time for taking photos of the extremely colourful Bee-eaters. 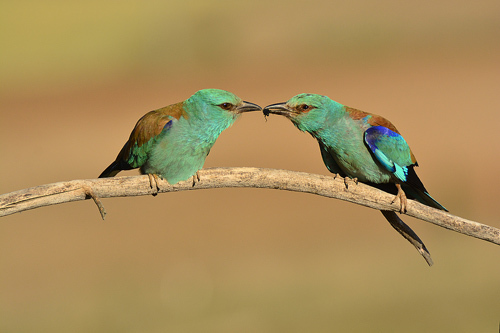 We offer two mobile hides in order to let you photograph these birds at close distance. 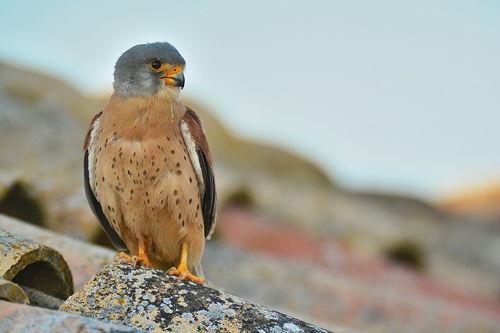 Lesser Kestrel, a migrant bird, can be photographed from March 15th till the end of June, except during the period of hatching (May 20th-June 10th). The hide is suitable for two photographers. Best light conditions: late afternoon. European Roller can be photographed during their breeding period from a mobile hide close to the nest. Period: May till June 10th. Because the birds do not chose a suitable place every year to breed, we cannot guarantee that this is possible every year. 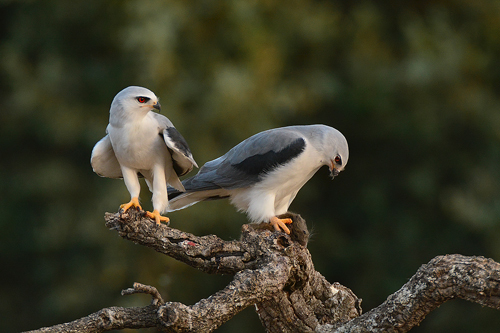 Many bird photographers like to photograph the Black shouldered Kite. Best period is between March 15th and May 10th. Unfortunately it is not possible every year. Be aware that there is a huge demand for this hide! 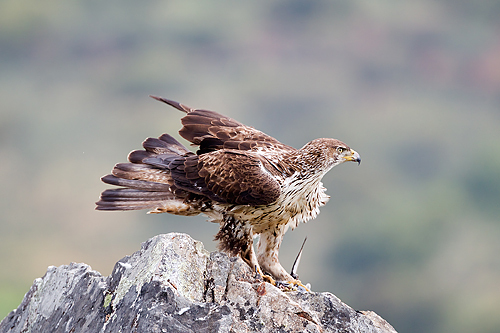 Another big species is Spanish Imperial Eagle, which can be photographed all year round. Only for experienced photographers. There are two hides. It is a two hour drive from our finca to get there. 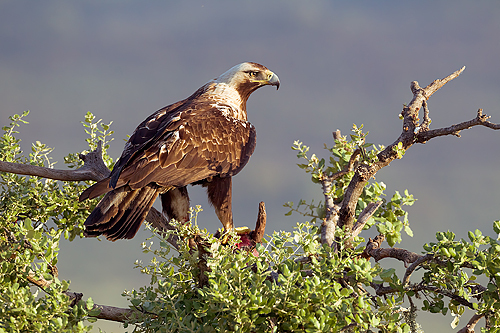 Bonelli's Eagle can be photographed all year round from fixed hides with a two-way mirror. Again this is only for experienced photographers. Two hides are available. It is a two hour drive from our finca to get to the hides. Price for one session: € 70 p.p. If you want more information or have any question about photographing birds from hides, don't hesitate to get in touch with us! Want to see more of my photos? Take a look at my latest book "Extremadura- be inspired!"